Tokyo Fist, one of the finest films from one of the greatest of all modern day outsider directors, Tsukamoto Shinya, is coming to UK Blu-ray and DVD in November with a spanking new transfer, courtesy of the good people at Third Window Films. An electrying and kinetically violent work in the archetypical Tsukamoto style, it climaxes in what we described in our review of the earlier Manga DVD as "a breathtaking, cinematic knock-out punch from a film that, in typical Tsukamoto style, assaults its audience in a manner that is both supremely satisfying and genuinely exciting – as with Tsuda, the harder the blows fall, the greater the desire is to be hit." 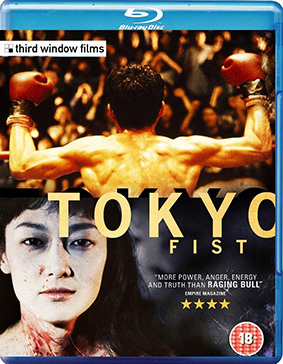 Tokyo Fist will be released on UK Blu-ray and DVD on 25th November 2013 by Third Window Films at the RRP of £19.99 for the Blu-ray and £14.99 for the DVD.